At midyear, the national opinion polls provide little indication of which way the political wind is blowing looking ahead to 2014, and 2016. Most of the key public opinion measures are mixed, or uncertain. Obama’s Standing – Historically, second term presidencies are often full of surprises and many of them unpleasant. Absent a surprise, so far, public opinion on Obama is running ahead of George W. Bush, but behind where both Ronald Reagan and Bill Clinton, whose unexpected troubles revealed themselves two years into their second term. So far there is little indication that recent Washington controversies have hurt Obama. Yes, the release of a recent CNN survey made quite a stir when it showed the president’s approval rating slipping significantly amidst the fallout from the IRS and the NSA surveillance controversies. But most other national polls, including the Pew Research Center’s, have shown little movement of late. 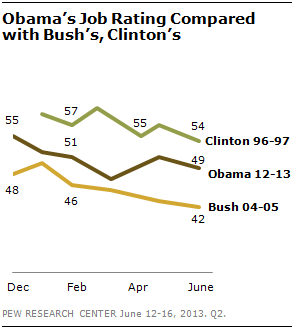 For the most part, Obama’s approval score is mixed and below the 50% mark. Last week’s Gallup rating was 47% approve: 45% disapprove. Pew Research had him at 49%:43%. This compares to CNN’s 45%:54% rating. And most importantly, Pew Research found the public remains divided over whether Obama’s policies have made economic conditions better or worse (35% for each); with 27% saying his policies have had no effect so far. Partisan Advantage – The national image of the Democratic party remains stronger than that of the GOP. The Republicans have come to be seen as the more extreme party, and as unwilling to compromise in dealing with the nation’s major budgetary problems. Currently, our poll shows 51% of the public holds a positive view of the Democrats, compared to just 40% for the GOP. However, the party’s image disparities notwithstanding, Americans rate the parties about equally for dealing with the major problems such as the economy, immigration and gun control. This only casts further doubt that the more popular Democrats can make progress in 2014, especially in the House, where the Republicans lost the popular vote in 2012, but kept control of the lower chamber. National Leaders – Despite some recent slippage, clearly Hillary Clinton is the most popular national figure. No other Democrat, not to mention Republican, comes close to her public stature. She will certainly enjoy a huge reputational advantage over other Democrats if she chooses to run in 2016. However, Democrats don’t have a good track record for nominating front runners, and the post Obama Democratic coalition may well hold some surprises. On the Republican side, where early front-runners more often succeed, there are none. The likes of Marco Rubio, Paul Ryan, Jeb Bush, Chris Christie and others will have to contend with a GOP divided between, the Tea Party, and more Main Street Republicans, not to mention a high-profile libertarian minority. How, and if the party broadens its national base and moderates its image will be crucial factors affecting both who will be the nominee and how well he or she will fare.